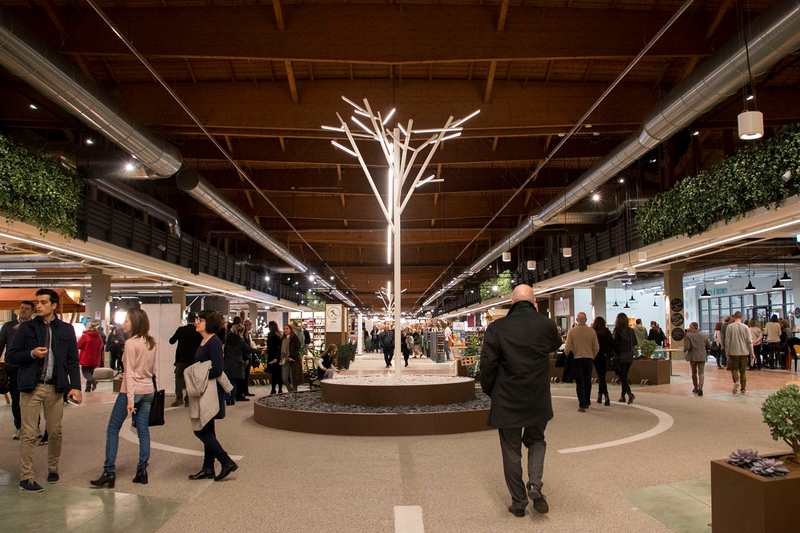 The collaboration between iGuzzini and Eataly carries on within FICO - Fabbrica Italiana Contadina (the Italian Farming Factory), the world’s largest agri-food park promoted by the Municipality of Bologna and run by FICO Eataly World. The theme park opened yesterday, on 15th November in Bologna. FICO Eataly World is a training ground for a sensorial and educational experience about food and its biodiversity, where the wonders of the Italian food and wine industry are represented by hundreds of small and medium-sized Italian high-quality businesses that will showcase live their manufacturing and crafting arts in order to tell the real story of Made in Italy. The lighting solutions implemented by iGuzzini enhance the area of 100.000 sqm through technologically advanced LED systems that highlight the architecture of the space according to the usability of the different areas within the theme park. More than 6.000 iGuzzini products have characterized the 10 covered hectares that host farming factories, eating points, shops, markets, sport and leisure areas, 6 classrooms and educational areas and a congress centre accommodating up to 1.000 people. A majestic intervention that features a range of LED sources with DALI technology that allows for intelligent light control and the possibility to create different ambiences as needed. A wide range of products have been used in the project - Albero and iWay in the square, iPlan Easy in the educational areas, Woody in the outdoor exhibition areas and iShop, View, Tecnica Pro and iRoll for lighting the other areas of the park. “We are proud to be a FICO partner and to have collaborated with our lighting solutions in such an important and extensive project. The opportunity to illuminate the most important agri-food park in the world gives further continuity to the collaboration between Eataly and iGuzzini, two international Italian excellences that place people and quality of life at the core of their business” said Andrea Sasso, iGuzzini CEO. iGuzzini’s lighting has been applied over the years in the following Eataly locations: Eataly NYC Flatiron, Eataly NYC Downtown, Eataly Chicago, Eataly Seoul, Eataly Milano Smeraldo and Eataly Trieste.